Dress up your dog or cat (just a little bit) this Christmas with a cute Puppy Angel Sweet Xmas Cape. Beautifully made with a faux fur collar, the cape is trimmed in tiny pom poms. The cape is fully lined with red satin-effect fabric and there's a cute rhinestone Xmas Tree and Stars design on the back. ropes, again tipped with cute pom poms! 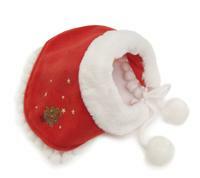 or for festive fun in the cold weather!